If you need pressure washing done on your home, driveway or fence, just give us a call. 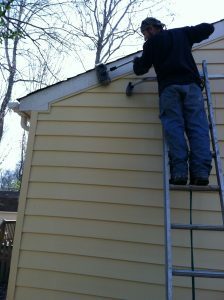 We offer high and low pressure washing to make sure that no water is goes behind the siding. Most exterior paint jobs will need pressure washing before painting can be done. This will help to knock off any old paint that may be pealing and clean any mold or mildew off the surface so the new paint to bond correctly. Copyright © 2019 Shelton Home Improvements. All Rights Reserved.